An Oct. 20 lecture will kick off a new series on language and inequality co-sponsored by the Center for the Study of Inequality and the departments of linguistics and sociology. Michel DeGraff, professor of linguistics at MIT, will present a talk, “Language, Education, and (In)equality in Haiti: Struggling through Centuries of Coloniality,” which will focus on linguistic inequality and the exclusion of “local languages” in education. These exclusions, he says, reflect power struggles both within and across colonial and postcolonial societies. DeGraff argues that linguistic equality is a prerequisite to economic and political equality. The lecture intended for a general audience will take place from 3:30-5 p.m., Oct. 20 in Uris Hall G08. DeGraff is the director of the MIT-Haiti Initiative, a project aimed at helping Haitians learn in their native language of Haitian Creole ("Kreyòl"). The initiative reflects DeGraff’s belief that the teaching of Haitian children in French hinders their learning. The project seeks to improve quality and access to education by facilitating instruction in Haitian Creole, through faculty development and the creation of Haitian Creole curricula. DeGraff was granted $1 million by the National Science Foundation in 2012 to introduce online Creole language materials in the teaching of STEM in Haiti. He is also a founding member of the Haitian Creole Academy. His research focus is on the areas of syntax, morphology and language change. DeGraff will also be giving a lecture in the linguistics colloquium series, “Walls vs. bridges around Creole languages and their speakers,” Thursday Oct. 19, 4:30pm, Morrill 106. 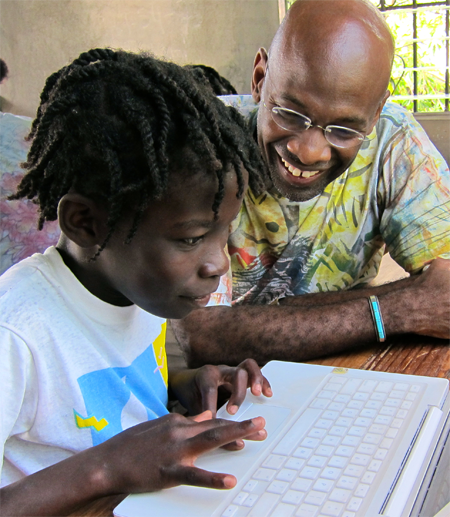 Photo taken by Christine W. Low of Michel DeGraff in Matènwa, La Gonave, Haiti, working with students as part of a Kreyòl-based STEM initiative.